The game will be bigger in my head before the game than after the game. But during the game, it will be just a game against a good team and you want to win. There will be some unusual questions before the game because I am a Swede, but during the game it will be another game that we have to work on different tactical stuff. Sweden is a very good team. The match will be played at noon (ET) today and you can follow it on MatchTracker. 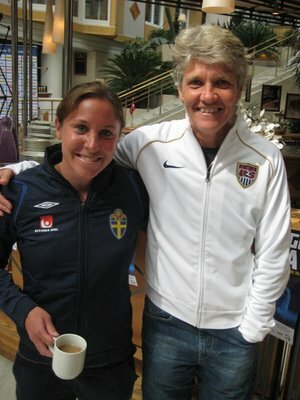 It’s a big deal in Sweden – with local papers trumpeting the showdown with headlines like “One Day to Go.” Pia, in the meantime (known in some circles as 71) met up with 72 for a press conference. 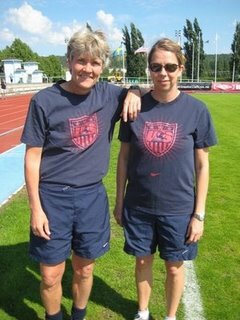 That’s Pia with Hanna Ljungberg, whose 72 career goals for Sweden recently eclipsed Pia’s longstanding record of 71. It’ll be fun to see 72 on the pitch today (if we could actually see the game). In other sports news, the Phillies and Red Sox both won, to celebrate the 4th nicely. The Williams sisters meet today at Wimbledon in the Women’s Finals … and I’m aiming for a wee track work-out at some point today, time permitting. Yesterday I managed a 3-hour kayak jaunt on the Merrimack River. It was a gorgeous paddle, marred only slightly by some wild young women on a JetSki. I spotted a Great Blue Heron, a passel of Cliff Swallows, and a foraging Beaver (the latter was very up-close and personal). I took a swim, did some writing on a beach along the way, and just had a very nice, quiet afternoon. On the Bushie front (sorry to ruin your morning) I read about more efforts to line the pockets of the rich … this time via a land grab that will pave the way for lots more McMansions near Missoula. Perhaps the Bushies have let go of “legacy” and are now just focusing on what amounts to larceny. 1/20/09 can’t come fast enough! This entry was posted in Politics, Soccer, etc. and tagged arctic circle, Bush, Bushie, Bushies, Cliff Swallows, debate, hanna ljungberg, Helena Andersson, John Edwards, Karl Rove, kayak, matchtracker, Merrimack River, Missoula, Norrvalla Stadium, Norway, Phillies, Pia, Red Sox, singing swede, Skelleftea, snake dance, Swede, Sweden, US, USSF, USWNT, williams sisters, wimbledon, women, World Cup. Bookmark the permalink. …a “passel of cliff swallows”: what a sweet sound–and sight. Lovely.